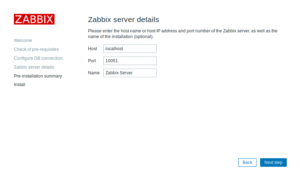 You are here:Home » Tutorials » Open Source » Install Zabbix on Ubuntu 18.04: Easiest & Fastest Way! 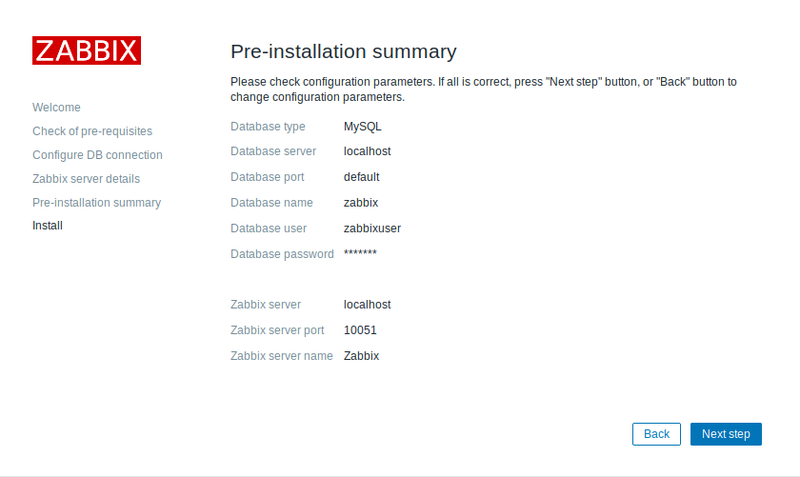 In this Guide, you will learn how to install Zabbix on Ubuntu 18.04 in a few simple steps. The installation process got significantly easier than in the previous version of Ubuntu Server 16.04. I will lead you through each step. Zabbix is a very popular monitoring solution that can be used to monitor your on-premise and cloud devices. It integrated very well with Grafana, which will be dealt with in another tutorial on its own. 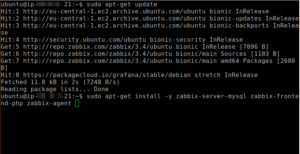 For this tutorial, I install Zabbix 3.4 on an Ubuntu Server 18.04 in Amazon EC2. 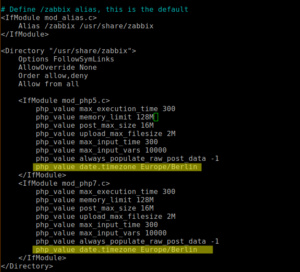 Now we need to update our system and install the Zabbix Server, Zabbix Agent and Zabbix Frontend packages. 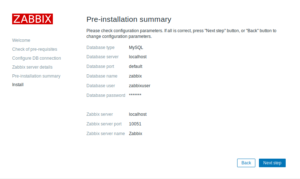 The Zabbix Server packages include MySQL. Now we need to change the Timezone in our apache.conf. Adjust this setting to your own Timezone. 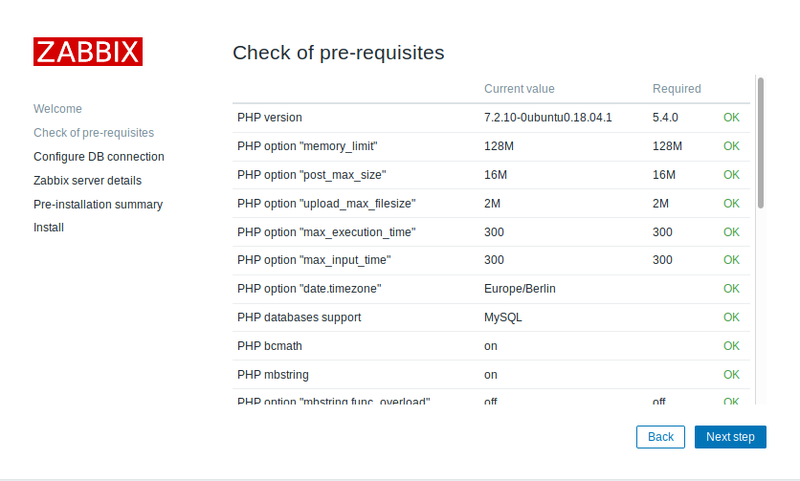 You can look up php Timezones here. Make sure you enter the Timezone exactly like on the website, the input is case sensitive. Make sure to remove the # before the line to make it active. Save the file by pressing CTRL + O and press CTRL + X to quit. Of course, you are free to adjust this to your liking. Once you are done with this, we have to import the DB. 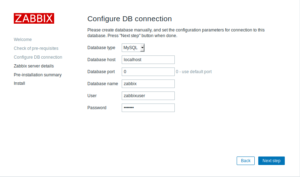 When prompted for a password, enter your MySQL password that you have set in the step above. 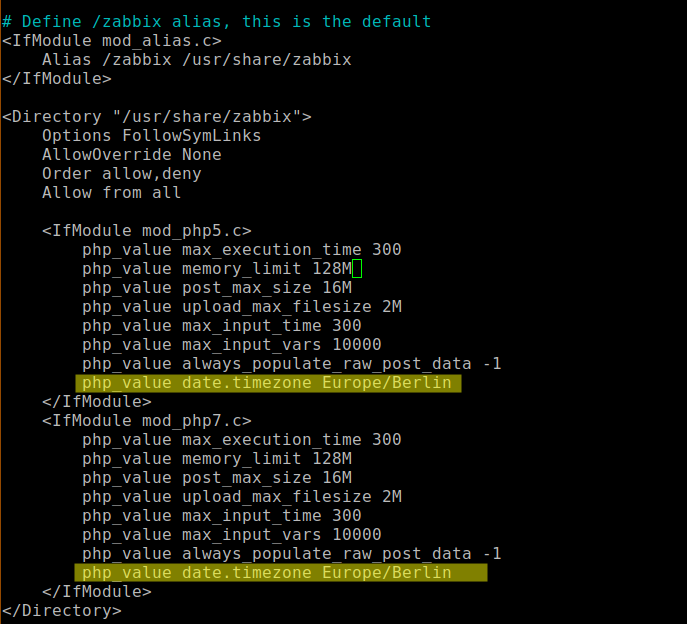 Now we need to update the Zabbix configuration with our Database details. You can use the search function to find them. Make sure DBPassword and all other values have the # removed in front of them. 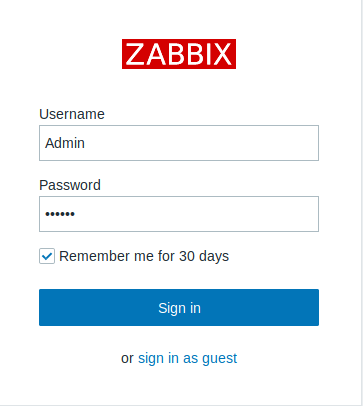 You will be greeted by the Zabbix Version and Welcome Screen. 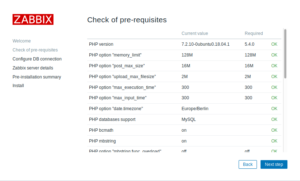 When clicking next, a final checkup will run that evaluates if you meet all the requirements to install Zabbix on Ubuntu 18.04. Now we need to enter the Database details that we have created earlier. Click Next step when finished. Now you can specify a name for your server. Choose whatever you like. After double checking, if everything is correct on the Pre-installation summary page, click Next step again and click on Finish on the next screen. When you have done this, you are greeted with the Login screen. 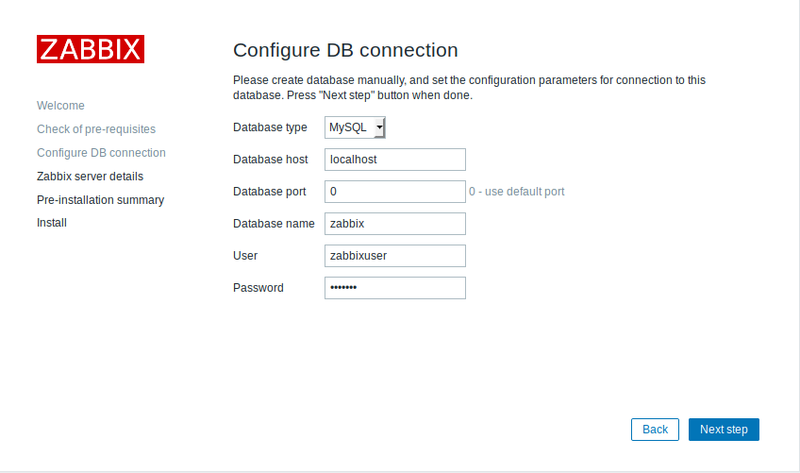 You can log in with Admin / zabbix. The username is case sensitive. The first thing we need to do after logging in is changing our Default Password. So head to Administration, Users and click on your Admin User. Click on Change Password and choose a new one. 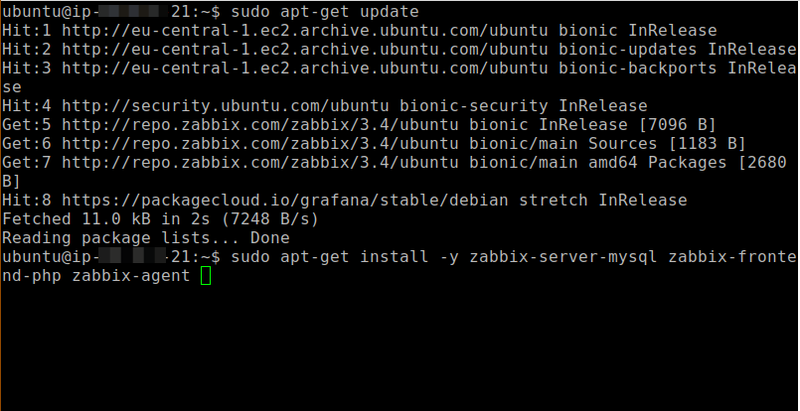 As you can see, it is really easy to install Zabbix on Ubuntu 18.04. It is certainly much easier than on Ubuntu 16.04, at least for me. 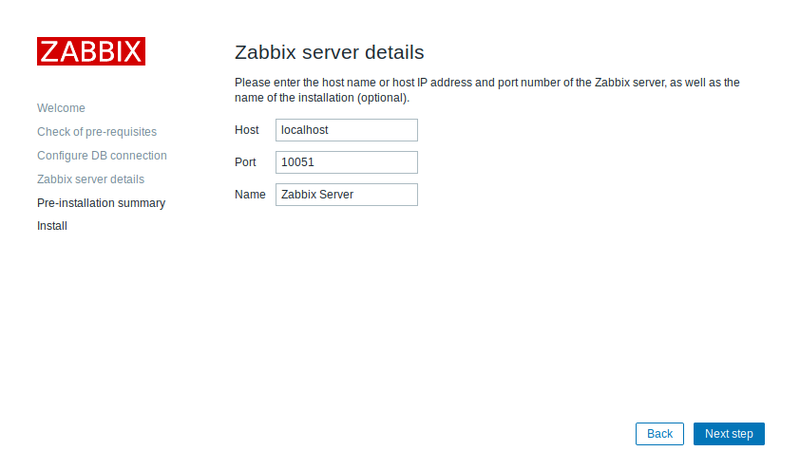 You now have a freshly installed Zabbix in place and you can start rolling out Zabbix-Agents on your clients. There will be a separate tutorial on how to do this in the future. This was awesome and helped me so much thank you! 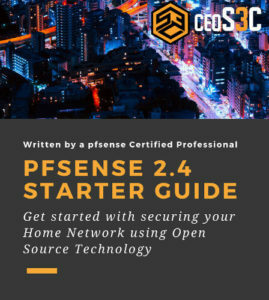 If you can do a tutorial on how to set up agents on different machines and then run through some basic monitoring, that would be amazing. thanks for leaving a comment! I’m actually working on it, although can’t exactly say when it’s going to be done. Sign up for the newsletter or check out my Patreon once a month, I usually post updates there.